15 : Pench - Nagpur - Bangalore. 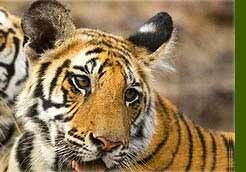 As the name suggests, India Jungle Tours specializes in the wildlife tours. 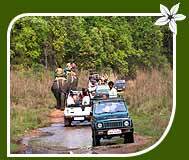 Indian Wildlife Safari Tour covers major wildlife destinations throughout the country. Not only this, we will avail an opportunity to visit some important tourist destinations including Delhi, Jaipur and Agra. The tour package is for those who are wildlife enthusiasts, adventure tourists and common vacationers. This tour will last up to a long duration of 21 Nights/22 Days. 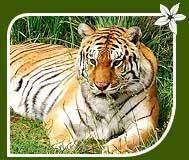 Sariska Tiger Reserve is famous its tigers, Leopard, Wild Dog, Jungle Cat, Hyena and Jackal etc. 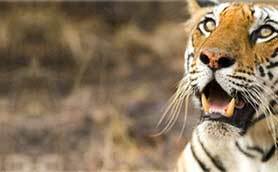 Ranthambhore Tiger Reserve provides a rare opportunity to have a close a glimpse of Royal Bengal Tiger. After breakfast drive to Sariska where you will visit the popular Tiger Reserve famous for its tiger population. On arrival transfer to hotel. In the afternoon, you will take a tour of the jungle, where you can view numerous carnivores including Leopard, Wild Dog, Jungle Cat, Hyena, Jackal, and Tiger. Overnight stay at the hotel. Early morning visit the sanctuary again. Later drive to Jaipur, en-route visiting the Amber Fort. On arrival, check-in at the hotel and later on go for city tour where you can see City Palace, Jantar Mantar and observatory. Overnight at hotel. After breakfast drive to Sawai Madhopur, popular for the Ranthambore Tiger Reserve. At this national park you can see the Royal Bengal Tiger and capture some spectacular views of the majestic Aravalli ranges in your camera. On arrival transfer to hotel. Evening Jungle excursion roaming around the forest area to observe the rich wildlife, which includes trees, aquatic plants, birds, reptiles including the Marsh Crocodile, amphibians and mammals. Overnight at hotel. After breakfast we move on to Bharatpur. 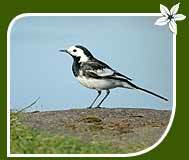 Visit the Keoladeo Ghana National Park known for its 300 indigenous bird species. Evening, a short walk to the Jungle to observe the roosting of large bird swarms. Start your day by bird viewing at the Bharatpur sanctuary where you can see migratory birds like Cranes, Pelicans, Geese, Ducks, Eagles, Hawks, Shanks, Stints, Wagtails, Warblers, White Ears, Flycatchers, Buntings, Larks and Pipits. Later drive on to Agra En-route visiting Fatehpur Sikri. On arrival transfer to hotel. Afternoon city tour to Agra visiting the magnificent Taj Mahal - The Monument of love, built by Mogul Emperor Shahjahan in 1630 to enshrine the mortal remains of his queen Mumtaj Mahal. Also visit Agra Fort. Overnight at the hotel. After breakfast drive to Bandhavgarh National Park in Madhya Pradesh. On arrival transfer to hotel. Apart from Tiger Bandhavgarh has Chinkara, Nilgai, Chausingha, Jakal, Rhesus Monkey, Langur, Porcupine Ratels, Sloth Bear, Wolf, Chital, and Sambar etc. Overnight at hotel. Day 15 : Pench - Nagpur (93 Kms / 02 Hrs.) - Bangalore. Morning game viewing at the Park. Later drive to Nagpur to connect flight for Bangalore. On arrival transfer to hotel. Evening is free for your own activities. Overnight at hotel. After breakfast half day sightseeing tour to Bangalore visit Bangalore's botanical gardens before touring the ancient Bull Temple and Tipu Sultan's Palace. Afternoon drive to Mysore (125-kms / 3 hrs.). On arrival at Mysore transfer to hotel. Later in the evening visit Brindaban gardens. Overnight at the hotel. After breakfast visit Mysore palace and Museum - built in the Indo-Saracenic style. It's an imposing structure standing the heart of the city and is one of the largest of its kind in India. It was formerly the residence of Wodeyar family. The Palace is a breathtaking sight particularly on Sundays & public holidays when it is illuminated. Later drive to Nagerhole National Park. On arrival transfer to hotel. Enjoy a wildlife viewing on the afternoon jeep safari trip. Overnight at hotel. Early morning wildlife viewing and bird watching in the park or a Coracle ride on the Kabini River. Enjoy an evening jeep ride or an Elephant ride into the Nagerhole jungle. Overnight at hotel. After early breakfast drive to Bandipur. On arrival at Bandipur transfer to the resort. Afternoon visit inside the wildlife sanctuary in jeeps. Overnight stay at the resort. After early breakfast drive to Ooty. On arrival transfer to hotel. Ooty is famous for its rolling hills covered in pine and eucalyptus forests and also for its coffee and tea plantations. We will visit the famous and most beautiful Botanical Garden of Ooty which covers an area over 20 hectares and is planted with more than a thousand varieties of plants, shrubs and trees including orchids, fern and alpine. We will drive further to visit Dodabetta peak, the highest in the Nilgiris. Rest of the day at leisure. Overnight stay in the resort. Morning is free to relax. Later drive to Coimbatore (90 Kms 2 Hrs. drive), to connect flight for Chennai. On arrival at Chennai transfer to international airport to connect flight for onward destination.